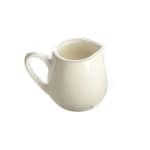 The American Metalcraft PCR25 creamer dish is made of durable porcelain and has a white, rounded design. Since the pitcher has a handle, it is easy to lift and pour. This dish has a 21⁄2-ounce capacity, which is ideal for a single person.